A shade tree makes a big difference to the comfort of this couple. The physical features of urban areas shape the capacity of older adults to engage in many activities when it’s hot. These include vegetation volume and coverage, thermal design, and the extent of shading in public areas and walkways. Increasing urban greenery may offer a way to improve older people’s comfort and social experience. Older people are more vulnerable to heat stress. An important task is matching the design of communities with the needs of an ageing population. Where older adults live and the quality of their local areas strongly influence their lived experiences. Yet recent research found the experiences of seniors were often not accounted for in research on neighbourhood design. While these facilities are purpose-built for older people, many in Australia were built well over a decade ago, when heat stress was not such a large concern. Many more facilities are being built now and will be into the future. Yet it is uncertain whether they are being actively designed to reduce the impacts of heat. What has our research found? Queensland’s ‘unprecedented’ bushfires were part of a year of extremes. The Bureau issued four Special Climate Statements relating to “extreme” and “abnormal” heat, and reported a number of broken climate records. With the whole of NSW declared in drought during the latter half of 2018, this drought will be recorded as one of the more significant in Australia’s history, ranking alongside the Millennium, 1960s, World War Two and Federation Droughts. Of those historic droughts, only the Millennium Drought saw similar, accompanying high temperatures. The below-average rainfall has persisted for around two years across much of NSW and adjacent regions. The drought conditions were particularly severe in the recent spring period, with low rainfall, persistently high temperatures, and record high evaporation. This exceptionally dry period was influenced by sea surface temperatures to the west of the continent. Perhaps fortuitously, a developing El Niño in the Pacific Ocean failed to mature in the second half of the year. An El Niño would have typically exerted a further drying influence on eastern Australia. The dry conditions in eastern states were severe enough to see Australia record its lowest September rainfall on record, and the second-lowest on record for any month — behind April 1902, during the prolonged Federation Drought. Over 2018, Australia’s annual rainfall was 11% below average, and the lowest recorded since 2005, during the Millennium Drought. In contrast, above-average rainfall was recorded across parts of the tropical north, and most significantly in the Kimberley, consistent with recent trends of increasing rainfall in that region. The drought conditions were exacerbated by record or near-record temperatures across many parts of the country. It was Australia’s third warmest year on record, behind 2013 and 2005. Daytime maximum temperatures were the warmest on record for NSW and Victoria, and second-warmest for South Australia, the Northern Territory and Australia as a whole. Persistent dry conditions through winter are typically associated with low soil moisture and heatwaves in the following spring and summer, and 2018 followed this pattern — with the added contribution of a warming climate. The year ended with some record-breaking heat events. Perhaps the most significant of these was the extreme heat along the central and northern Queensland coast in late November and early December, which saw maximum daytime temperatures of 42.6 °C in Cairns and 44.9 °C in Proserpine on the 26th of November. These temperatures, combined with persistent dry conditions in the preceding months, saw catastrophic fire weather and bushfires along 600km of the Queensland coast, an event that fire agencies have called unprecedented for the state. The year ended with a burst of heat over the Christmas-New Year period, with temperatures at least 10 degrees warmer than average across southern South Australia, most of Victoria and southern NSW, leading to Australia’s warmest December on record. Subscribe to receive Bureau Climate Information emails. Think of an Australian landscape and you’re unlikely to picture snow-capped mountains or alpine meadows. But that’s what you’ll find atop the peaks of the country’s southeastern corner. 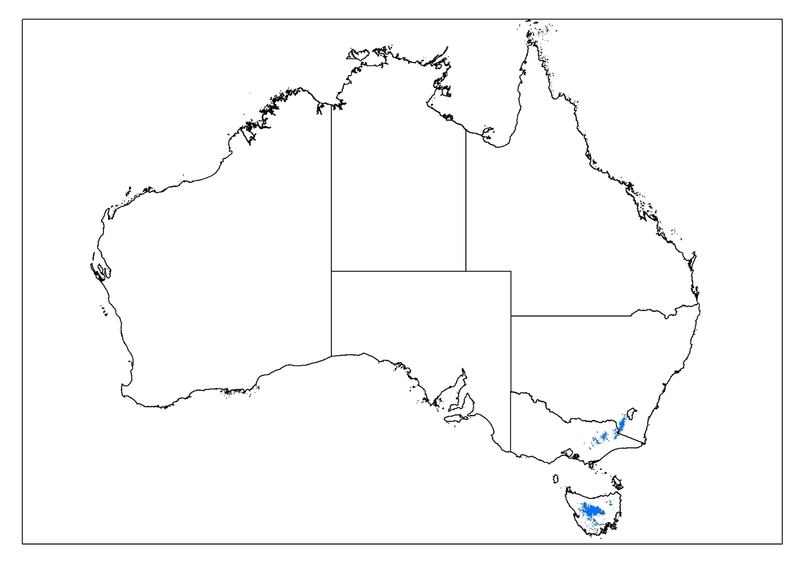 The distribution of alpine and subalpine landscapes in Australia. Although relatively small – covering about 11,000 square kilometres or 0.15% of the continent – these alpine and subalpine ecosystems have outstanding natural value and provide billions of dollars’ worth of benefits to the nation each year. They are in comparatively good health but are facing numerous threats. However, their health in decades and centuries to come will depend largely on how we deal with these threats now. Australia’s main alpine and subalpine areas are the Snowy Mountains in New South Wales, the Bogong High Plains in Victoria, and central and southwestern Tasmania. They occur above about 1,400-1,500m on the mainland, and 700-1,000m in Tasmania. Although Australia’s mountains are relatively low by global standards (Mt Kosciuszko, the continent’s highest peak, rises only 2,228m above sea level), there is true treeless, alpine vegetation above the climatic treeline. Treeless patches may also occur in the high subalpine zone, just below the treeline, typically on rolling high plains where accumulations of cold air or water prevent trees from establishing and growing. The alpine climate is cold, wet, snowy and windy, with a short growing season. The soils are highly organic and can hold tremendous amounts of water. Alpine plants are short: mostly tussock-forming snow grasses, rosette-forming herbs such as snow daisies, and ground-hugging shrubs. 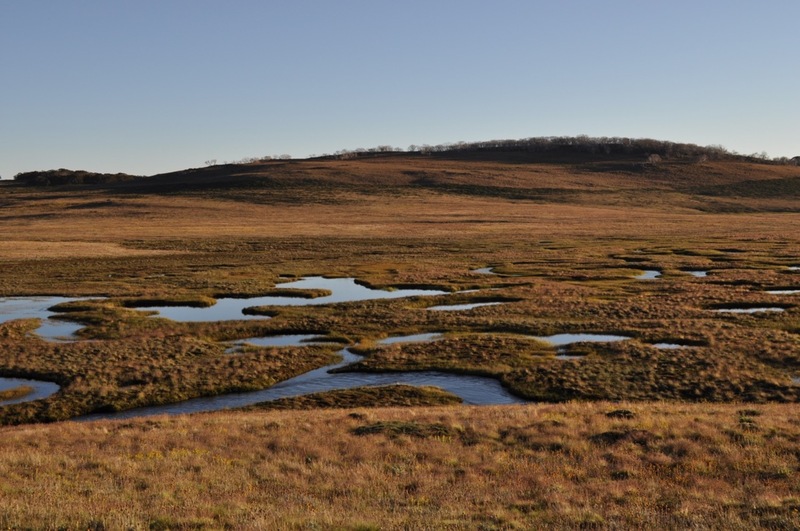 The dominant plant communities are grasslands, herbfields, heathlands and wetland complexes rich in peat moss (Sphagnum). The animals are mostly invertebrates such as moths, grasshoppers and ants. The Australian Alps are hugely important for conservation, water production and recreation. Most alpine areas are within national parks and are home to many unique plants and animals. There are about 700 native alpine plant species on the mainland, while some animal species are extremely rare – there are only about 2,000 mountain pygmy possums in the wild. Major rivers – such as the Murray, the Murrumbidgee and the Snowy – begin in the Alps. Water from alpine catchments is worth A$9.6 billion a year to the Australian economy. Millions of people visit every year to camp, walk, ski, ride and take in the scenery. The Alps are one of Tourism Australia’s “National Landscapes” and the local tourism industry is worth hundreds of millions of dollars annually. The alps also have a rich history of scientific study, dating back to celebrated botanist Sir Ferdinand von Mueller in the 1850s. Pioneers of Australian alpine ecology, Alec Costin and Maisie Carr, established some of the earliest study sites. Research continues to this day and now includes international climate science projects such as the International Tundra Experiment and the Global Research Initiative in Alpine Environments. Experimental plots established by Maisie Carr and John Turner in 1947 (photos taken in 1999). Aerial and close-up images both show the striking difference in the vegetation of the ungrazed plot compared with the grazed plot. Grazing ceased on the Bogong High Plains in 2003, and in Kosciuszko National Park in 1967. These scientific discoveries about alpine flora and fauna, and the factors that affect them, have directly informed land management practices. We now know that high levels of vegetation cover are needed to protect alpine catchments; that livestock grazing damages alpine ecosystems; how to better implement cost-effective weed control; how to better manage small Mountain Pygmy Possum populations; and that large, infrequent fires do not necessarily cause “ecological disaster”. Alas, the alps face multiple threats, including global warming, invasive species, disturbances such as fire, increasing pressure from human recreation, and unsound ideas about how to manage the high country. The climate has already changed. Since 1979, average temperatures during the growing season on the Bogong High Plains have risen by 0.4℃, while precipitation has decreased by 6%. 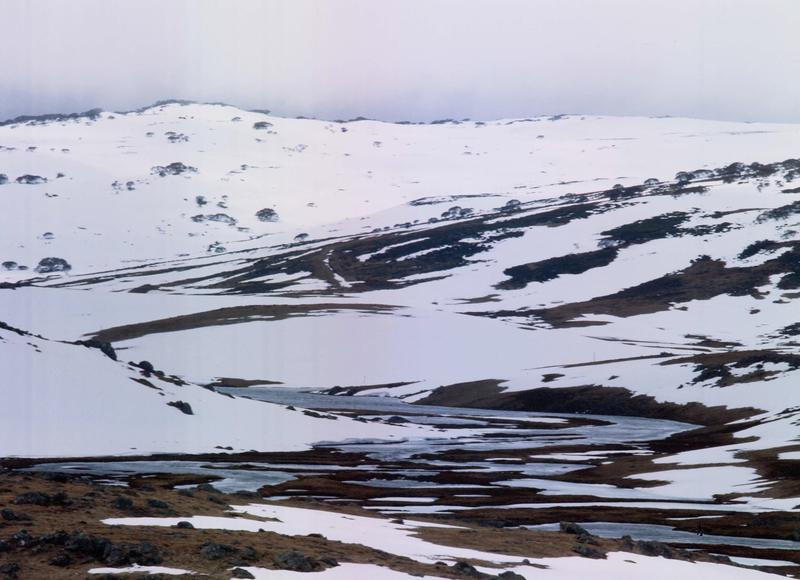 Since 1954, the depth and duration of the snowpack in the Kosciuszko region have declined. Rising temperatures are a serious problem because the Australian Alps are relatively low mountains and the alpine species, already at their distributional limits, have nowhere else to go. Woody vegetation may increase – the treeline may rise and shrubs are likely to expand into grasslands and herb fields, which may make the landscape more prone to fire. Mainland alpine ecosystems can regenerate after large fires. But Tasmania’s alpine vegetation is extremely fire-sensitive, and more frequent fire is likely to be detrimental to all alpine ecosystems. The threat of livestock grazing to alpine ecosystems has all but ceased. However, feral animals and plants are a clear threat and will become more difficult to manage in the future without concerted action now. Horse and deer numbers are increasing with alarming speed. These animals are occupying habitats well above the treeline. Many alien plant species have invaded the alps over the past half-century, a trend likely to be exacerbated by climate warming. 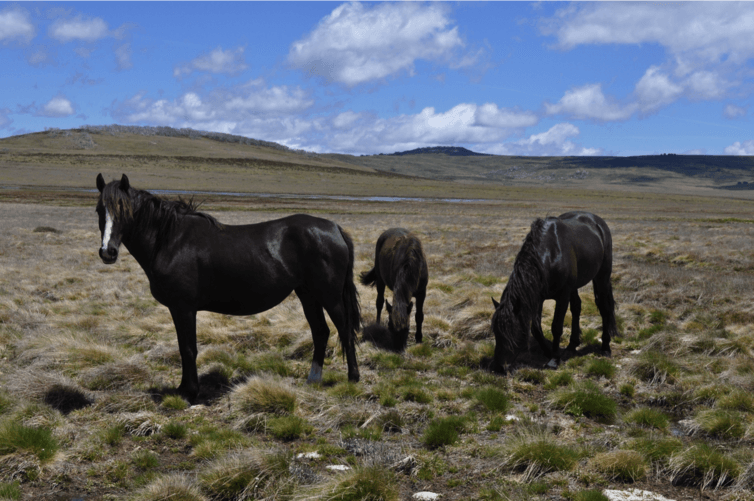 Feral horses in Pretty Valley, Bogong High Plains. We also need to be wary of maladaptive ideas and practices, particularly those concerning the putative benefits to the alps of large non-native grazing animals. We have variously been told that “alpine grazing reduces blazing” (it doesn’t); that grazing combined with burning has “actually prevented soil erosion” (it didn’t); and that a “sustainable, viable” feral horse population can “co-exist” with the alpine environment (surely an oxymoron). There may be strong cultural imperatives behind these propositions, but they have no basis in science. 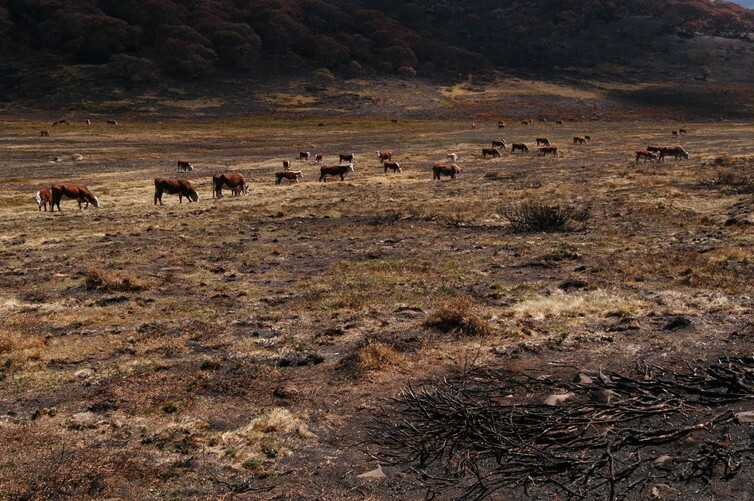 Cattle grazing on the Bogong High Plains, days after the extensive 2003 fires. 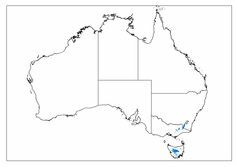 Australian alpine vegetation did not evolve with large, hard-hooved animals such as sheep and cattle. The combination of burning and grazing is known to damage alpine soils and vegetation. There is cause for hope, however. The Australian Alps are on the National Heritage List, which is protected by federal law. There is also still time. The world is acting on climate change. Some species may adapt genetically, while some likely changes to vegetation may happen slowly. Scientists and land managers are working together to anticipate and manage change in the alps. Change is inevitable, but with enough research, imagination and action, our high country will provide Australians with high-value environmental benefits for generations to come.